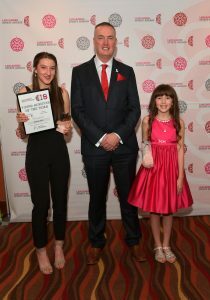 Sponsored by Positive Together, which is funded by the Lancashire Police and Crime Commissioner, this award is for some of the most talented performers across the County, who show exceptional dedication to their sport and have the potential to perform at the highest level. Nominations are encouraged from those who have represented their County/Region/Country in their chosen sport. The winner of the Young Achiever of the Year Award 2018 was Ruby Russell. Ruby competes at regional, national and international levels of taekwondo. In the last 12 months, she has achieved 9 Gold medals, 10 Silver medals and 8 Bronze medals in multiple events. Ruby started the year as Midlands Champion, N. Midlands Champion and Scottish double silver medallist, she then took national titles in the English and Welsh Championships. She is now double British Champion and has recently been crowned double World Champion.